Astronomers hunting distant worlds say they have made one of their most significant discoveries to date - a kind of hot twin to our Venus. 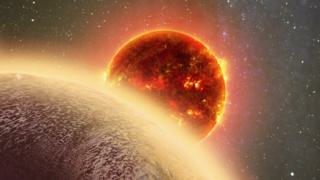 The rocky planet, known as GJ 1132b, is not dissimilar in size and orbits a star some 39 light-years from us. This makes it close enough for any atmosphere to be examined in detail by the next generation of telescopes now in development. To date, only very big worlds have been amenable to this kind of study. Scientists are keen to do the same with more diminutive targets because it may be their best bet of establishing whether or not life exists beyond our Solar System. At a separation of 39 light-years (370 trillion km), we are unlikely ever to visit GJ 1132b with a spacecraft. But if we can identify the molecules that make up its air, this could reveal a lot about what is happening down on the surface. In truth, GJ 1132b is very low on the habitability index. It circles so near to its star (a "year" lasts just 1.6 Earth days) that it is being "oven roasted", as one scientist on the discovery team put it. This means any water will have boiled away, but it could still retain a substantial atmosphere. This makes GJ 1132b more like a Venus than an Earth - although Venus receives a 15th of the heat at GJ 1132b. Venus is certainly hot, just not quite that hot. Nonetheless, even with poor life prospects, astronomers believe GJ 1132b would still prove a useful testbed for future observations of planets that enjoy more benign circumstances. Studying the atmospheres of distant worlds is no easy task. It is done by probing the light from a star as the planet passes in front - as viewed from Earth. Molecules in the air will imprint their chemical signatures on this light. Unfortunately, most of the planets we know are so distant that the details are beyond being resolved by current telescopes. And it is often the case anyway that the parent star is so big and bright that its glare simply swamps the delicate signatures being sought. As a consequence, only large planets - equivalent in size to our Neptune, or bigger - have betrayed information about their atmospheres. However, these are not so interesting as small rocky planets, which are far more likely to have a broader range of gases relevant to life. Observing GJ 1132b is made easier because its host star is what is termed a red dwarf. Such stars are smaller and cooler than our own Sun. They are also considerably dimmer, as a result, and this would compensate for some of the glare problem. It is also the case that red dwarfs are 10 times more common in the galaxy than Sun-like stars. So, just in numerical terms, this makes their planets pressing candidates for further study. "The exciting thing is that, yes, it is probably true that the closest potentially habitable planets are going to be orbiting red dwarf stars," said Zachory Berta-Thompson, whose team found GJ 1132b. "And if we want to study the atmosphere of such a planet, it's going to be a lot easier to do that if the planet is orbiting a small, cool star, like the red dwarf hosting GJ 1132b," the Massachusetts Institute of Technology astronomer told BBC News. The telescopes needed to do the job are not far from entering service. Super-observatories on Earth that have mirrors up to 40m across will come online in the next decade. But even before then, the successor to the Hubble Space Telescope should be in operation. Known as the James Webb Space Telescope, this facility will launch in 2018. Its detectors will be tuned to probe targets just like GJ 1132b. "The JWST will be a planet-characterising machine," commented Drake Deming from the University of Maryland, who is eager to study the atmospheres of smaller planets. "It will have access to longer infrared wavelengths than Hubble, and it's in the infrared spectral region that we will get the most information," he told the BBC's Science In Action programme. Details of the discovery are reported in the journal Nature.